I have had a Lavender plant for the past several years that grew quite big but finally died this past season. It was not as lush as the picture here but I usually was able to harvest a bunch of Lavender that I could enjoy every year. I will miss that plant but will be picking up some new ones at the local Farmer’s Market this year. People have asked if I grow my own herbs for my soaps or make my own oils, unfortunately the amount of Lavender Essential Oil I use requires allot more than one plant and I do not have as green a thumb as my Mother had. Lavender Essential Oil is steam distilled from the flowering tops only so it takes many flower stalks to make the oil. One of my dream vacations is to go to Provence, France during the Lavender harvest on an aromatherapy tour. A field of Lavender – what a wondrous site that would be to behold and to smell ! I think my senses would be overwhelmed but very very happy! 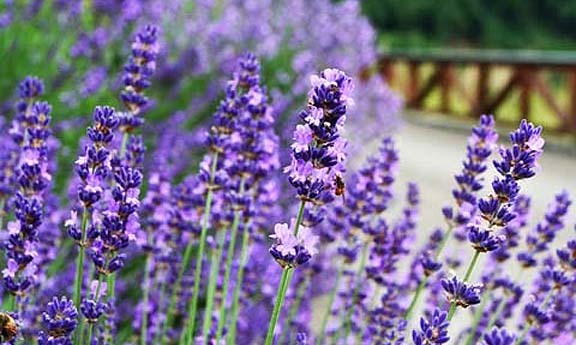 Lavender is an oil that has had a long tradition. The person who first coined the term aromatherapy was Rene-Maurice Gattefosse was working in a perfumier business and when he got a sever burn , he stuck his hand in a vat of Lavender oil and as a result was able to heal his hand quite rapidly and the oil helped to prevent scarring. So Lavender was there at the start of modern day aromatherapy. Lavender is one of the few oils that is said can be applied directly to the skin. The scent of Lavender is usually familiar to everyone with its fresh herbaceous, floral aroma. This little oil has over 100 constituents including linalyl acetate, linalol, labeandulol, etc. Its amazing to me that how these different components are broken out depends on how the Lavender smells and what its characteristics are. For example there is Lavender grown in France and there is also High-Altitude Lavender- both the same species but depending on where it grows affects the chemical makeup of the plant and the final scent of the flowers and this affects the therapeutic properties of the essential oil. More tomorrow on the qualities of Lavender Essential Oil. Excellent post! I am growing my own Lavender from seeds and I picked up a plant from a local nursery. I had no idea that the chemical makeup and scent can be altered depending upon the scent and where it is grown. That is impressive. Thank-you for sharing that. Very cool.